Patients come to A. R. Menzies from as far away as Cape Breton, mainland N.S., P.E.I. and Maine. It was only last summer that Allan saw a former patient, now living in Saskatchewan and returns to his summer home each year, who reminded us that he has been coming to Menzies since 1929. He was just three years old! The field of prosthetics involves the design, fabrication and fitting of artificial limbs (prostheses) intended to replace a portion of the body that has been lost through amputation or congenital reasons. Designing a prosthesis first begins with an in-depth assessment with the patient and prosthetist. Each person is unique and the range of their activities and goals are different. 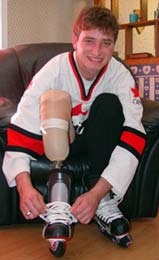 Every prosthetic device is designed to fit the needs, goals and desires of the individual and their lifestyle. Work begins on designing an artificial limb by making a plaster mold of the patient’s residual limb. The mold is then used as a guide in constructing a socket that fits over the residual limb and connects with the artificial leg below. New advances in material development and technology offer comfortably fitted and lightweight appliances. Innovative plastics, acrylics and carbon fibre components, in association with computer technology, provide a diversity of appliances from simple to highly functional devices. Cosmetically, a prosthesis can appear very life-like with the use of prosthetic skins and foam covers shaped to match the anatomical leg. The clinic at A.R. Menzies is fully equipped to do all customized manufacturing and fabrication onsite. When adjustments and modifications need to be made they can be done easily in-house, providing the patient with greater convenience and service. Allan is pleased to schedule a complimentary evaluation as well as explore and explain the options that are available to help a patient return to greater mobility and independence. The field of prosthetics involves the design, fabrication and fitting of artificial limbs (prostheses) intended to replace a portion of the body that has been lost through amputation or was absent at birth (congenital). Prosthetic devices include everything from cosmetic restorations to highly functional devices. Cosmetic or passive designs can appear very life-like and are often custom made with silicone materials. Although they typically do not have active functions (e.g. opening and closing of the hand) they may still be a helpful tool for activities of daily living. More functional upper limb prostheses include body powered (cable driven) and externally powered (myoelectric) devices. Different types of shoulder joints, elbow joints and hands or hooks are available. Lower limb prostheses are functional devices because they are designed to improve the patient’s mobility. The level of cosmetics depends on the patient and the type of leg provided. Foam covers (shaped to match the anatomical leg) and prosthetic skins are available. Covers serve to both improve cosmetics and protect the components of the leg. Various functional hip, knee and ankle joints are also currently available. Every prosthetic device is designed to fit to the needs, goals and desires of the individual. 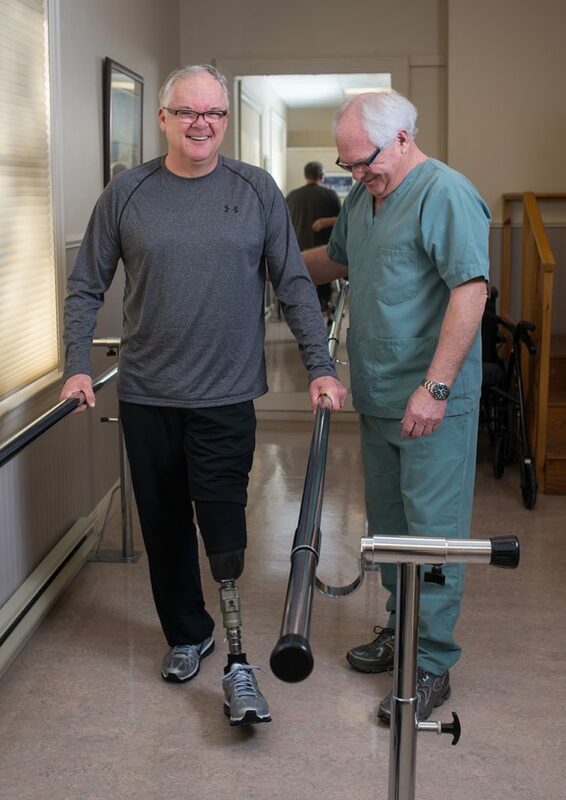 Together with the physician and other member of the health care team, you and your Prosthetist can discuss options to determine the best prosthetic device for you. Service is usually at the request of the physician with the help of the prosthetist as to the type of prosthesis that is to be provided, adjusted, or repaired. Once we have received a prescription from the physician, we work with the individual to determine the optimal design of the prosthesis within the parameters indicated by the prescriber. Our prosthetist consults with the client to determine his/her needs, goals, objectives, the extent of the disability and any other factors which may affect the fit and function of the device. In the event of a new prosthesis, admission is made at the local hospital’s rehabilitation wing. Here, the physiotherapist assumes the role of training the client to walk and to become self-sufficient with their new prosthesis. When the physiotherapist and physician feel the client is ready to go home, we assume the role of follow-up on a one to one basis as required. How much does a Prosthesis cost and how can I pay for it? The cost of a prosthetic device is based on several factors that vary from patient to patient. These factors include the level of amputation, the activity level of the patient, the components and materials required, the complexity of the design and the time required to fabricate and fit the device. Although there are no set prices for prostheses, we can provide a quotation upon assessment. Prosthetic products and services are not covered under the New Brunswick Provincial Medicare program. The cost of a Prosthesis may be covered by private insurance agencies, charitable organization (e.g. War Amps of Canada) and in some cases patients may qualify for government assistance through Social Development programs. Other funding agencies include the Department of Veterans Affairs and Workers Health and Safety Compensation Commission. Every insurance plan is different and we recommend you contact your insurance provider for more information. My Prosthesis is not fitting/functioning properly. What should I do? If your prosthesis is not fitting or functioning properly or is causing discomfort, contact your Prosthetist for an assessment. We can evaluate the situation and determine what needs to be done. Modifications to the Prosthesis: Where, when and why? Where: Menzies is able to provide excellent patient care using our own onsite manufacturing facility. 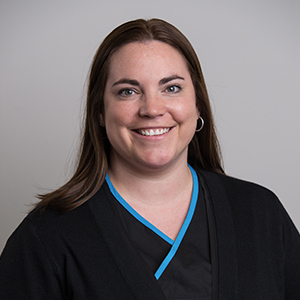 If modifications or adjustments need to be made, they can usually be done onsite providing the patient with greater convenience and better service for their prosthetic needs. The vast majority of our prosthetic sockets are also fabricated in-house. When: Your residual limb, like the rest of your body, will continue to change over time. Physical changes to the limb may be more dramatic at first but eventually these changes taper off. The prosthesis does not adapt with the limb and therefore modifications to the socket may be required. In cases where anatomical changes of the residual limb are more significant, a new socket may be necessary. Why: Changes to the residual limb occur as the result of many things including muscle atrophy, reductions in post-surgery edema (swelling), weight gain/loss, and volume fluctuations (fluids). These changes are normal and are expected. Minor changes in volume can be accommodated with the use of prosthetic socks. In the event of more dramatic changes to the residual limb, contact your Prosthetist for an assessment. Thank you so much for my new prosthetic arm which I have been wearing since October 2018. My new arm fits beautifully, looks fabulous and assists me with many daily tasks. It provides balance with walking , helps me carry items and helps with driving. As I reflect this New Years season (2019) I realize the Menzies family have been helping me for the past 68 years! I remember my Grandfather taking me to Menzies when I was only 4 years old. Your Dad, Laurie Menzies provided my prosthetic needs for many years. I remember the day we received the sad news that a plane crash took his brothers life. I always loved seeing Laurie as he was so kind, optimistic and happy. Laurie always lifted my spirits! We as patients are truly blessed that you are carrying the family tradition. The Menzies family have all made a difference in my life journey! You and your father have taken care of my prosthetic needs with care and compassion for many years. I express my gratitude and thanks to all. Happy New Year!" 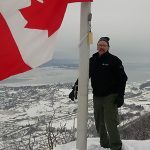 Actually here attached is a photo of myself on top the Sugarloaf mountain saturday changing the Canadian Flag. Six months ago I never would have tried it. The new prosthesis is giving me a renewed energy level or let's say dare level. Not really a dangerous mountain but in winter I never dared try before and two years ago in summer I did it but then couldn't walk for three days. Here Saturday I went up came down then worked 12 hour shift." I have been a longtime client of Menzies for the past 30 years. All their staff have been phenomenal and Allan has provided me the opportunity to live the most normal life! Without him I wouldn’t have been able to walk, run, play sports, be a mother as he has watched me accomplish throughout my life, just to name a few. Without my prosthetic legs I wouldn’t be able to do the things I have done even on a day to day basis. I really couldn’t thank him or his staff enough." I have been going to see Allan for the past 15 years. Allan has always been very accommodation to my needs. He has been able to help me live an active life and most people cannot even tell that I walk with a prosthetic leg." I am an AKA and have benefited from their services since 1983. I am always greeted warmly by staff and over the years we have had many great conversations. The services and support ar prompt, professional and compassionate. I continue to be very satisfied with the valuable and and personable services provided by Allan and staff." I’ve had the pleasure of knowing and working with Allan Menzies over the past twenty years. Allan has always been able to answer my questions and resolve any challenges or issues for which I have encountered. During this time, Allan has gone and above and beyond in accommodating my needs as a below knee amputee. Allan’s expertise and knowledge with the latest in prosthetics is the reason for which I consider him to be a leader in his field. 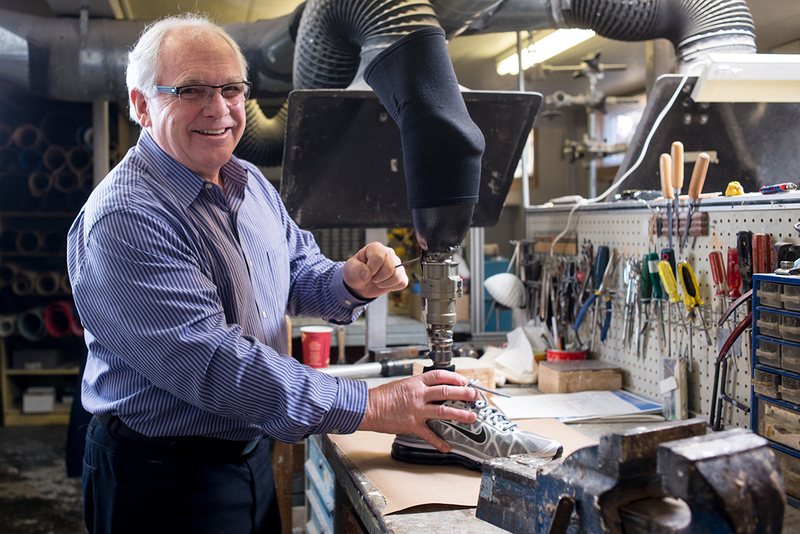 Depending on your activity level and lifestyle, Allan will work with you in his efforts of fulfilling your prosthetic needs."